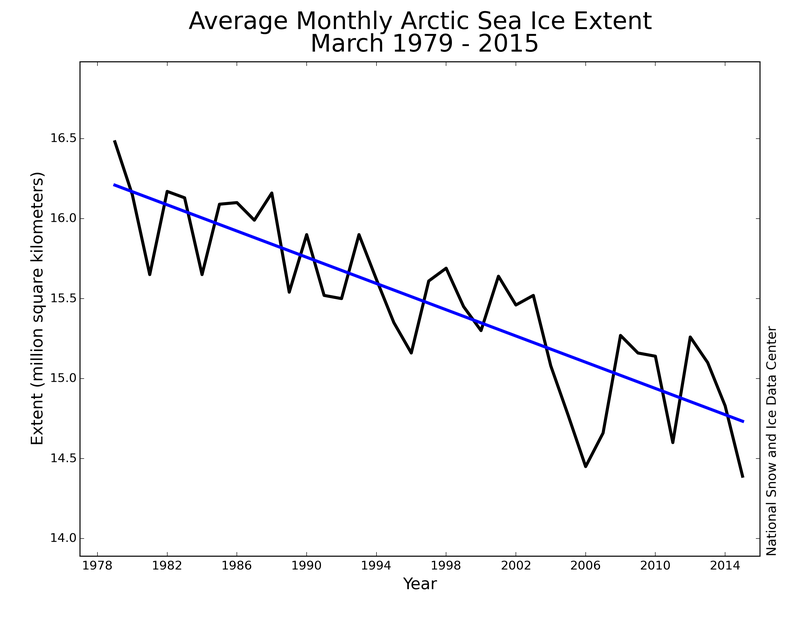 Only half or less of the estimated 2.6% loss per decade of March sea ice extent since 1979 (Fig. 1, below) represents a decline in polar habitat. That’s because several regions with sea ice that are not home to polar bears, like the Sea of Okhotsk, are included in Arctic sea ice totals. Figure 1. Average monthly Arctic sea ice extent for March 1979-2015 (which includes ice in the Sea of Okhotsk, the Sea of Japan, and the Baltic, where polar bears do not live), shows a decline of 2.6% per decade. NSIDC, March summary 2015. Both the Sea of Okhotsk and northern Sea of Japan (Fig. 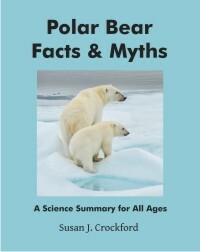 2) have sea ice in winter (which is included in total Arctic sea ice records) but they are not truly “Arctic” – neither is connected to the Arctic by continuous ice, even when the ice is at its maximum extent (nor is the Baltic Sea — in contrast to Hudson Bay and the east coast of North America, which are connected to the Arctic by continuous ice). Figure 2. Location of the Sea of Okhotsk and Sea of Japan. Insert ice map for March 1979 from NSIDC shows it’s position relative to the Arctic proper. 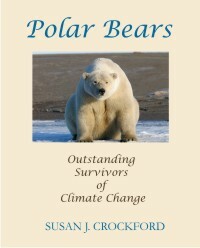 That lack of connection to Arctic pack ice is probably the main reason that polar bears never colonized the Sea of Okhotsk, even though western Arctic seal species (ringed, bearded, spotted, and ribbon) and Arctic whales (bowhead and beluga) live there. 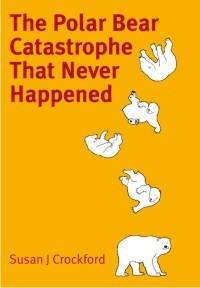 Polar bears don’t currently live in the Sea of Okhotsk and all evidence suggests they never have. 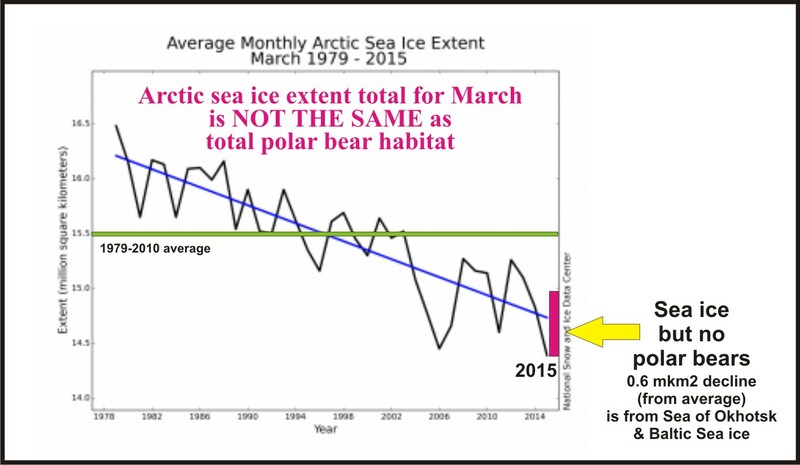 Sea ice maps show that about half of the total ice extent difference between March 1979 and March 2015 was due to a relatively large decline in sea ice cover for Sea of Okhotsk and northern Sea of Japan — regions without polar bears. Surely no reputable scientist or journalist would suggest that the “record low” maximum ice extent for 2015 has any relevance for polar bear health and survival? [or for Northwest Passage travel, for that matter] Sadly, they would. All Arctic sea ice habitats that are currently suitable for polar bears have polar bears living in them 1 – even the southern-most regions of Hudson Bay that are well below the Arctic Circle (see previous post on polar bear numbers here). 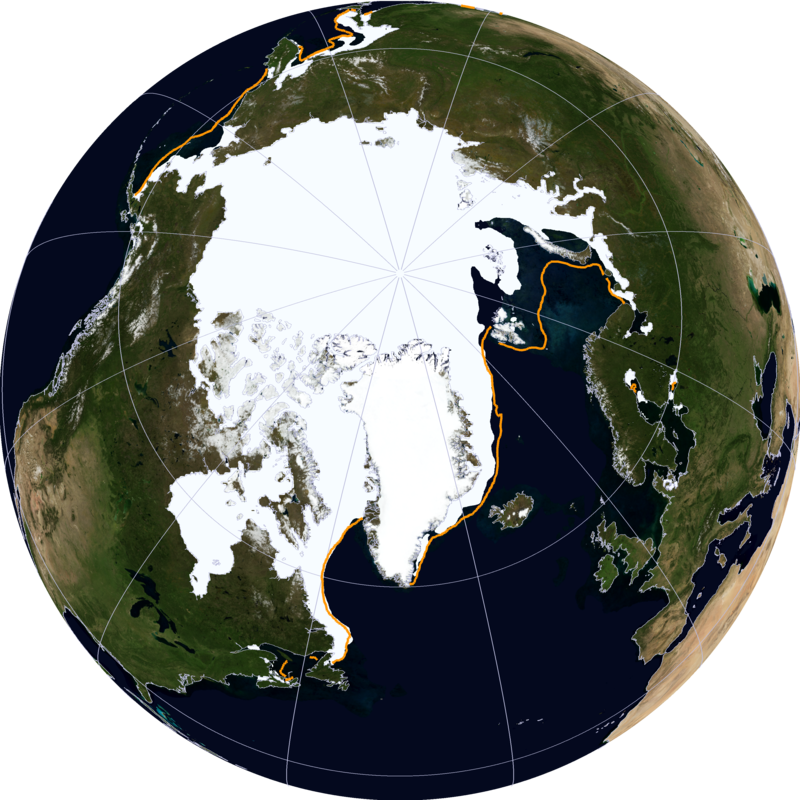 Have a look at the maps below and see how well the current maximum extent of sea ice correlates with the present range of polar bears around the Arctic. Fig. 1. 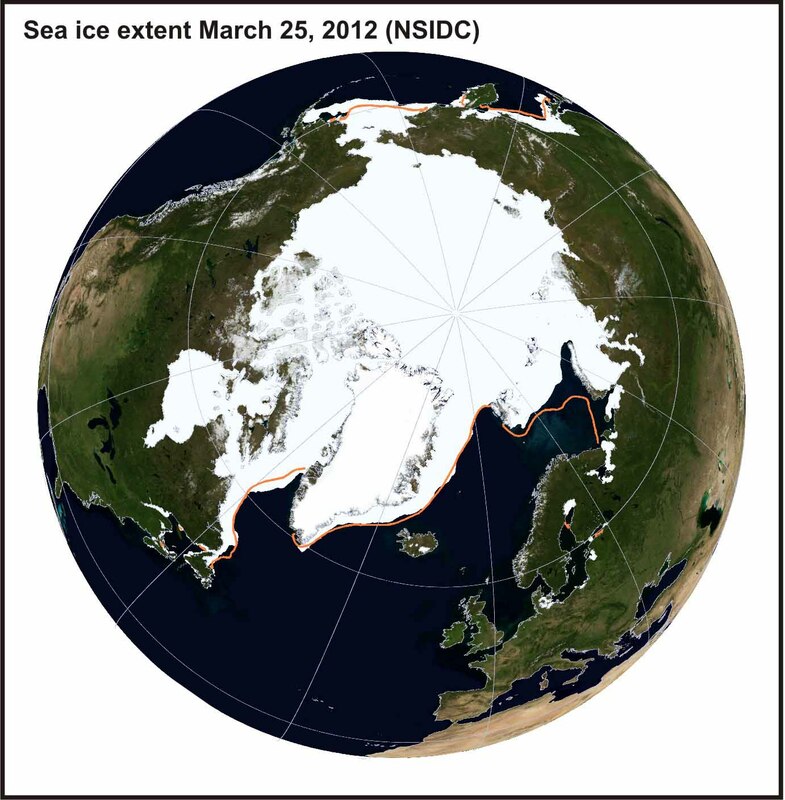 Sea ice extent at April 25, 2012, from NSIDC (the winter maximum). 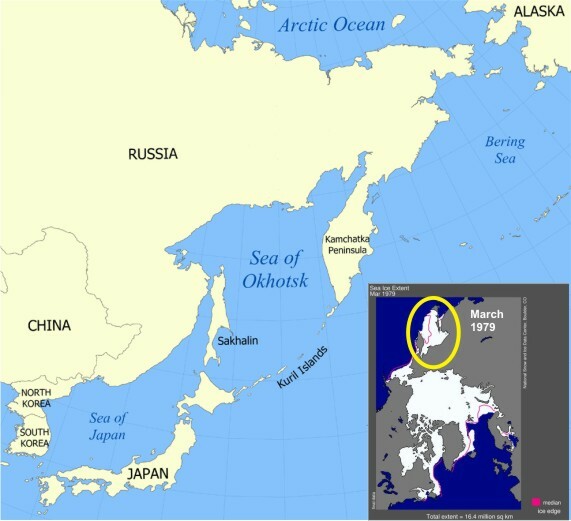 Note that although there is sea ice in the Sea of Okhotsk (top right of the map), polar bears do not currently live there nor is there any evidence they ever did1. Compare to the polar bear’s official range below. Fig. 2. The global range of the polar bear, showing the 19 regional subpopulations. 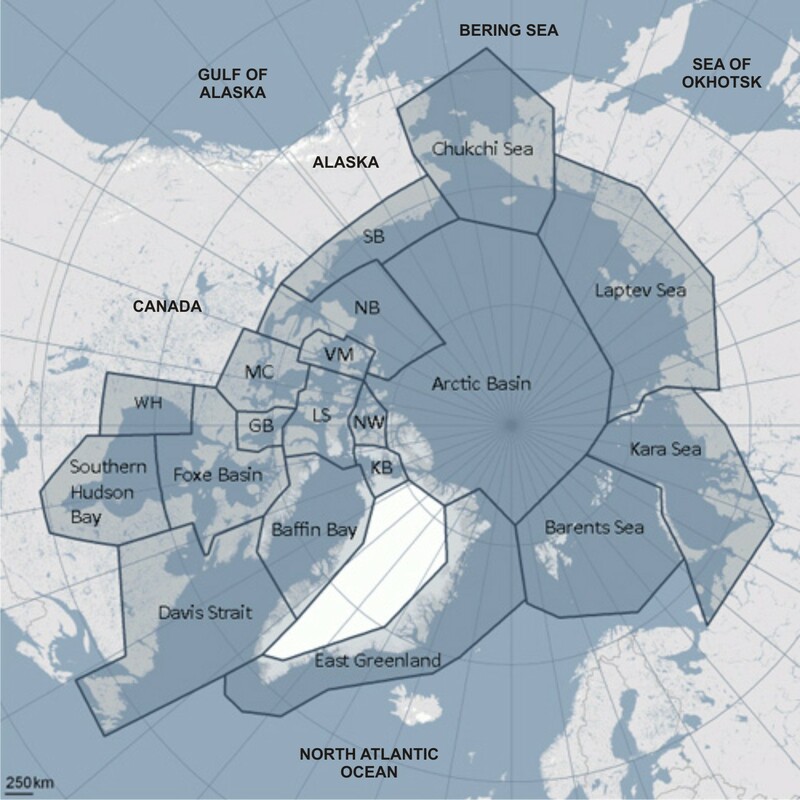 Map from Polar Bear Specialist Group (PBSG), with a few extra labels added.